Stocks continue hanging around 1,850, unable to build on Monday’s breakout to record highs. As we approach the end of the February, the market is flat for the year, failing to extend last year’s bull market. Markets often exhibit a consistent character through each quarter. Big money managers are judged by their quarterly performance and this often drives their decision making. If a quarter starts strong, they are forced to chase, motivated by fear of being left behind and end up prices higher into quarter’s end. As soon as the calendar changes, they are given three-month’s of breathing room and what was an urgent buying frenzy the week before, becomes a far more laid back approach. This played out perfectly over the last two quarters. In the closing weeks 2013, we had managers push us to record highs nearly every day. Big money was climbing over each other trying to buy all the stock they could find for their quarter and year-end reporting. But that buying evaporated the first trading day in January since they were no longer pressured by an arbitrary, calendar driven deadline. Since this quarter has not continued making new highs, managers don’t feel pressured to buy and is why we entered a sideways period. Without any sense of urgency, expect March to be equally laid back as we continue consolidating 2013’s gains. Expected Outcome: Stalling at the upper end of an extended trading range. Markets trade sideways more often than anything else, so holding between 1,750 and 1,850 for the next several months is likely outcome. While most of us either classify ourselves as bull or bear, we must recognize the market trades sideways most of the time, making the best trade buying weakness and selling strength. The 5% pullback to 1,740 did a good job of purging excess, making gains from here more reasonable and sustainable. While the explosive upside seems limited, momentum remains higher and this bull market is alive and well. 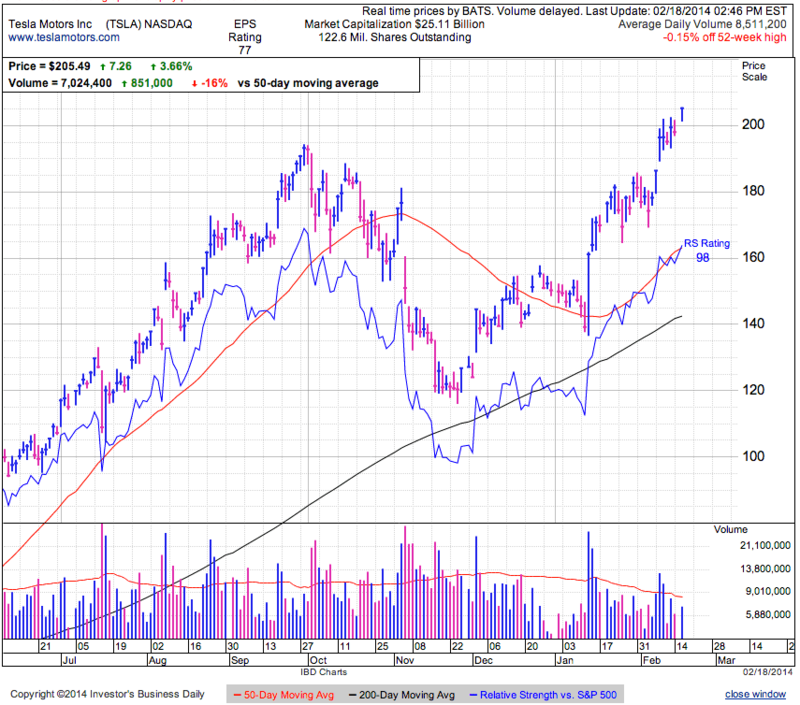 AAPL struggles while TSLA explodes to new highs. One is a story everyone loves and the other is a growth stock that terrifies anyone with common sense. The problem with a loved stock is everyone already owns it, leaving few to buy it. No matter how great a company is, prices fall when it cannot find new buyers. On the other side, a terrifying stock keeps going higher because so few people have the courage to own it, meaning those that bought into the hype are unlikely to sell at any price, keeping supply extremely tight. Basic laws of supply and demand; sell what everyone loves and buy what everyone is terrified of. Stocks pulled back after setting record highs Monday morning. This continues the sideways consolidation near 1,850 and we remain at the upper end of the recent trading range. Monday’s push to new highs triggered a wave of breakout buying and short-covering, but the surge didn’t last long as we stalled and retreated from those early highs. This suggests few are willing to buy the breakout because either they are already fully invested, or they don’t trust these valuations. Sometimes breakouts are the launching pad for strong upward moves, but other times they are the last gasps of buying before demand dries up and prices slide lower. While technicians believe all the information they need is contained in the chart, what market participants are thinking is even more important. Did we breakout because a heavy weight holding the market back was suddenly lifted? Or was it because all the good news has finally been priced in and there is little incentive for people to buy? Resolving Fiscal Cliffs and Euro Contagion lead to big moves higher because many traders were reluctant to own those risks, but once those clouds cleared traders embraced the market. More recently we had bouts of doubt over Emerging Markets and domestic economic data, but neither of those headlines whipped the market up into a frenzy. It is harder to say these were heavy weights holding us back and removing these obstacles will trigger a run to 1,900. On the other hand, its been a while since we had a real scare. The apathetic attitude held by many traders leaves us vulnerable to the next headline scare. While this rebound can continue, we are near the upper end of a potential trading range and this affects the risk/reward of initiating new positions. Following yesterday’s fizzled breakout, that shows there is not a lot of explosive upside in this market, meaning at best we will grind higher. On the other hand, we are 100-points from recent lows and that creates a lot of downside risk if buyers remain hesitant to buy above 1,850. Recent weakness and volatility left many people reluctant to trust this market. Recent sellers are slow to change their mind and they remain on the sidelines. This means the market is currently not over-owned since there is so much money available to chase another let higher. Buy weakness and sell strength. We are near the upper end of a potential trading range and the risk/reward suggests we be more defensive than offensive. Failing to reclaim 1,850 demonstrates a lack of demand at these levels and likely means further weakness in the near-term. If nothing else, this is a good place to take profits and wait for the next high-probability trade. Stocks are modestly higher and just 5-points shy of all time highs. 1,850 has been resistance since the end of 2013 and pausing here adds to the importance this key level. Sideways trade underneath resistance has drained some of the excessive excitement following the strong rebound from 1,740. 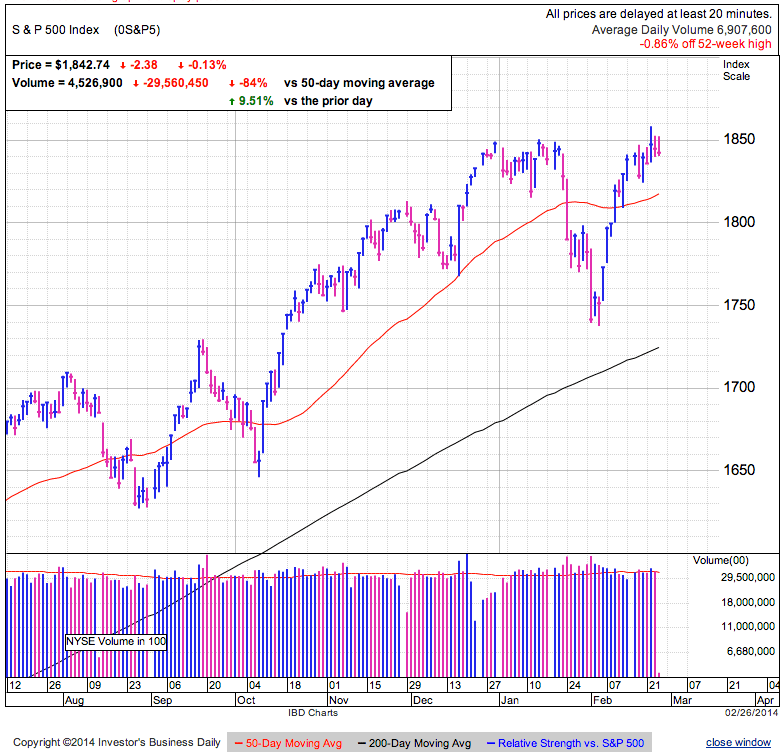 A market that appeared invincible last week is giving some second thoughts this week. But that is how markets work; if this were easy, everyone would be rich. As traders we need to decide what is more significant, stalling short of resistance, or holding near record highs despite half-full headlines? Extended and unsustainable markets typically roll over quickly, but maintaining these levels despite weakness on Wednesday is encouraging. That dip was more than adequate to trigger wider selling if the market was overbought and inclined to selloff. When that weakness reversed a day later, it demonstrated just how shallow the pool of willing sellers is and that bodes well for the near-term prospects. While the market is poised to head higher on tight supply, we need to watch demand for signals on where we are headed over the medium term. If new buyers fail to embrace a breakout to new highs, that could be what sends us back into the heart of the trading range. Expected Outcome: Headed toward upper end of extended trading range. While the high-probability trade remains higher, the risk/reward is moving the other direction. Given how far the market’s come and buyer’s reluctance to keep pushing us higher, likely means we are nearing the upper bound of this move. If we are indeed entering a 6-month trading range, at most we have a couple dozen points of upside left all while standing on top of a 100-point trapdoor. For a +24/-100 trade to make sense, we need a huge degree of confidence, something unheard of in free and fair markets. That means this is a better place to be locking in profits than initiating new positions. Pausing shy of 1,8500 and Wednesday’s dip to 1,825 cooled what was getting a tad exuberant. Consolidating and resting under resistance for another week improves the odds of a sustainable breakout. Either this market is headed higher, stuck in a trading range, or on the verge of collapsing lower. Se we are at the upper end of a potential trading range, that means 2 out of 3 options would have us pullback from current levels. Those odds imply this is good place to adopt a more defensive stance. While it feels good to watch our profits grow, they are only real when we sell. But even though the odds for a pullback improve by the day, as long as momentum continues higher, we don’t want to short the market yet. Wait for a breakout to new highs and then short the market when it fails to hold those gains. Stocks recovered a portion of Wednesday’s losses and remain between 1,810 support and the 1,850 highs. Wednesday’s selloff failed to gain critical mass because most weak owners were flushed out in January’s dip to 1,740. Anyone that bought recent weakness demonstrated an appetite for risk and volatility, meaning they are less likely to flinch when 2 out of 14 Fed members suggested raising interest rates earlier than previously stated. When most owners shrug off headlines, selling stalls quickly. Expected Outcome: In trading range, approaching upper end. Regaining its footing here likely means the market is setting up to break 1,850. It might take a few more days of consolidation between 1,830 and 1,850, but holding these levels in the face of worrying headlines shows this market is on firm footing. The bigger question is what happens after we exhaust the short-covering and breakout buying above 1,850. Since we are approaching the upper end of a potential trading range, this makes for a more interesting selling opportunity than buying one. A lot of good news is priced into the market here and it is hard to think of any big headline that could send the market racing ahead here. If the recent dip to 1,740 purged enough excess from the markets, we could resume last’ year’s uptrend following a breakout to new highs. There is plenty of international and bond money leaving those markets and in search of a home. While the immediate trend is higher, we are better off looking for a place to lock-in profits. A break to new highs would make a great selling opportunity and failing to hold the breakout could create an interesting shorting opportunity. AAPL failed to hold the 50dma and finds itself under this key level again. 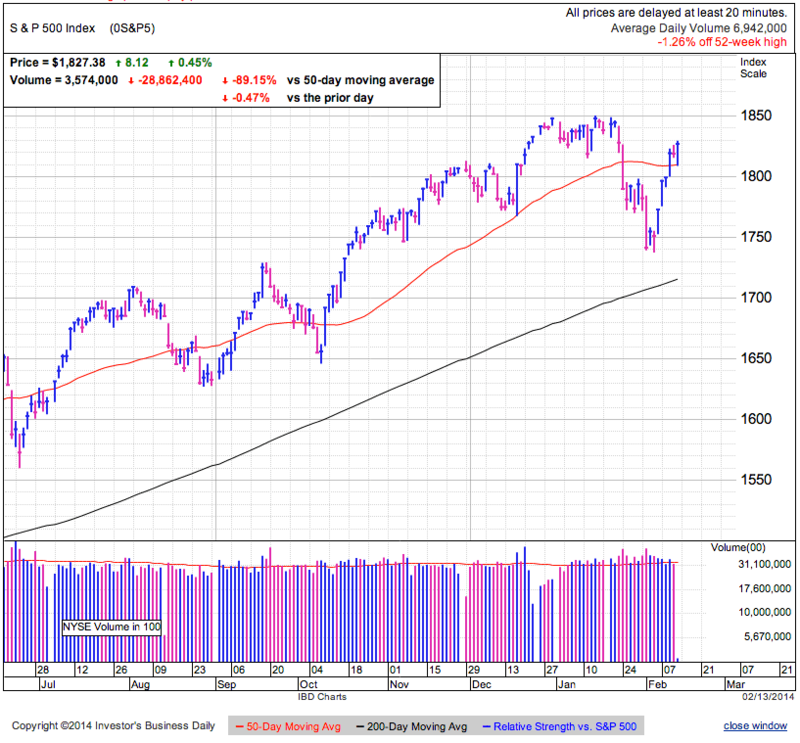 While the stock is stuck in no-man’s land after closing the earnings gap, a dip back under $500 spells disaster technically, while reclaiming $550 would be a big endorsement from the market. Until then this story could go either way. Since there is a lot of bullishness already priced in the stock and big buyers like Icahn and Cook have propped up the stock recently, the prognosis suggests further weakness once these whales finish buying. As a side note, I find it somewhat ironic that people were afraid to own AAPL when Jobs fell ill and resigned the CEO position. Many were worried about a lack of innovation without Jobs’s vision and leadership. Yet here we are, three years later without any meaningful innovation from the company, but now the crowd is making excuses for AAPL, claiming the next category killer is just around the corner. All I can say about FB’s latest acquisition is wow. Is a smart phone app really worth more than half of the S&P500 companies? TSLA is grossly over valued, but Whatsapp’s valuation would make even a TSLA bull blush. Most of the articles written about the deal promote the huge growth opportunities ahead, but when the app already counts a material portion world’s population as active users, it sounds like it is closer to saturation than explosive growth. The bigger concern for FB shareholders is this move by Zuckerberg reeks of desperation. If he feels he needs to spend a major portion of FB’s marketcap on a defensive maneuver, it means he feels threatened by emerging social media companies. Maybe FB doesn’t have as firm of a grip on its users as most investors assume. At least Zuckerberg’s actions suggest that. Stocks continue consolidating under resistance at 1,850 as we trade between the 50dma and January’s highs. If the market is entering a 6-month consolidation, we are likely near the upper end of the expected trading range. Most feel better given the rebound to near all-time highs, but so far buyers are reluctant to continue chasing above 1,850. Dip-buying and short-covering provided much of the lift from the 1,740 lows, but that buying frenzy is slowing as we approach old highs. This pause is intensifying the focus on 1,850 as more people start watching this increasingly important level. The longer we hold underneath it, the bigger deal it will become if/when we break it. Shorts and breakout buyers are watching this level with interest and moving above it will lead to a new surge of buying, but that will likely be the last round of buying. Reaching new highs means most of the shorts have already been squeezed and breaking above prior resistance will tempt the last of the hesitant momentum buyers. Once we reach 1,860, we will largely have exhausted demand from short-covering, dip-buying, breakout-buying, and value-investing. At that point we need to find a new crop of money to continue pushing us higher. While the near-term momentum is higher and we will see another wave of buying if we break 1,850, no one should expect another 100-point run over the next few weeks. The best profit opportunities come to those who are willing to take the biggest perceived risks by buying when everyone else is panicking. Buying the market here is more risky and has less upside, making this a better place to sell than buy. The market experienced a fair amount of churn during the 5% pullback. Chasing off the weak and replacing them with confident owners makes it far easier for the market to continue higher. Confident owners don’t sell and when no one wants to sell, prices keep marching higher. Buy weakness and sell strength. As we approach old highs, spend more time thinking about locking-in profits than making new buys. Stocks are modestly higher following the long weekend and continue holding the rebound’s gains. We remain above the 50-dma, 1,830 support and less than 10-points from all-time highs. Calm is returning to US and global markets following recent turmoil. Nothing dramatic happened over our three-day weekend and stocks are still maintaining recent gains. While the dip to 1,740 was unnerving, there is no such thing as an easy dip to hold. If dips didn’t scare people, we wouldn’t have them because no one would sell. This move purged the weaker and less committed, replacing them with more confident owners willing to buy the dip or hold through the volatility and uncertainty. The market bounced as supply dried up when we ran out of nervous sellers and the confident continued holding. But that was the justification for buying two weeks ago. Now that we are 100-points higher, what comes next? Shorts forced to cover losing positions provided much of the demand, as did swing traders and value investors buying the dip. With prices returning to record highs, we’ve largely run out of shorts needing to cover, value buyers are less interested, and swing traders are more likely to sell these gains than buy them. 10-points from all time highs, the last surge of buying will come if/when we break 1,850. That will squeeze out the last of the shorts and give breakout traders a buy signal. But given how much buying we’ve seen over the last two weeks, this breakout is likely the end of the move, rather than the start of a new leg higher. Once everyone who was ready to buy, bought, the rebound will invariably stall on lack of demand. Markets trade sideways more than anything else, and given what a strong year 2013 was, it should be no surprise if we pause and consolidates over the next six months. Sideways markets are best suited for buying weakness and selling strength. Short-term traders can lock-in recent gains, long-term traders can wait for weakness before adding to existing positions, and shorts can start looking for the headline that will trip us up. The dip to 1,740 shook many traders out of the market and turmoil in overseas markets has those foreign investors looking for a refuge. Recent sellers and international demand could provide the lift that fuels another rally-leg higher. Swing traders should start looking for an exit. Longer-term investors should dial back purchases as we return to the upper end of the range. Anyone still out of the market will be better suited waiting since chasing a market that ran 100-points in two weeks elevates the risk of an intermediate pullback. TSLA is poised to close above $200 for the first time. The recent rebound off the 50dma is pushing the stock to all-time highs, but the time to buy the stock was weeks ago, not today. While there are a few dollars of momentum left, expect it to consolidate recent gains near $200, giving a patient buyer time to get in later without exposing himself to extra downside risk by holding through a consolidation. 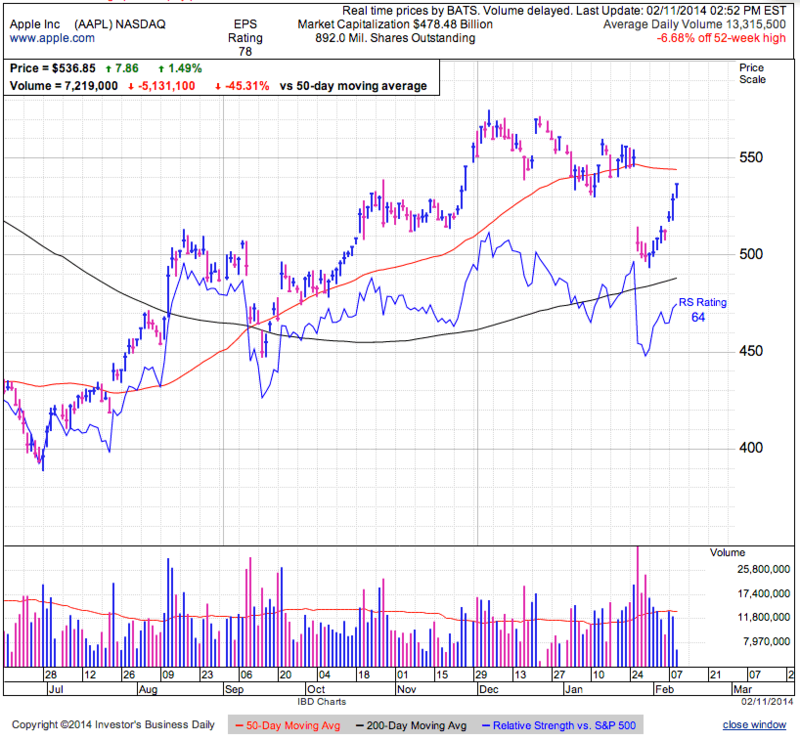 AAPL is also showing strength and ready to close above the 50dma for the first time since the Q4 earnings call. 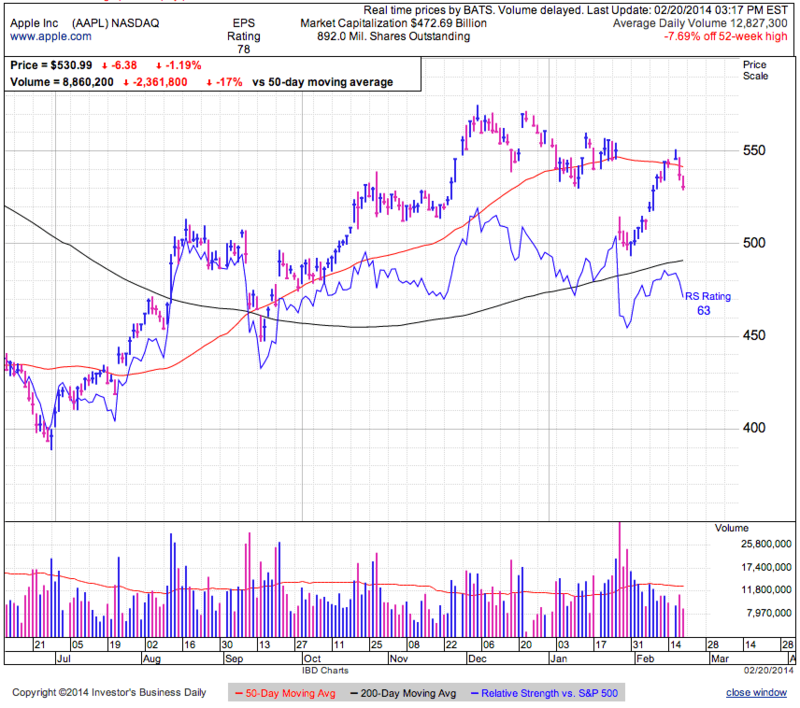 Much of the strength came on the heels of AAPL’s aggressive buyback in recent weeks and expectations of a new product. Hopefully this a new category killer and not another iMaps or iCloud fizzle. A larger screen phone seem highly likely, but is that enough to get all the Samsung Galaxy defectors to switch back? No doubt a large screen phone will sell well, but it is more like to be bought by existing AAPL customers upgrading and less likely to be stealing back market share from the competition. Of course the biggest benefit will be finally slowing customer defections to large screen competitors. Stocks are modestly higher as they continue adding to the recent rebound. We are about 15-points from all time highs and back within the early January consolidation. Support is back near 1,810 and overhead resistance is at 1,850. Whatever the market was afraid of last week is a distant memory as the only thing traders are worried about now is being left behind. Clearly bears are getting squeezed and doing much of the buying as they cover their shorts for a loss. The bigger question is if a wider group of investors will support these prices once bears and chasers are done buying. Having seen this market so decisively bounce back, no doubt it is erasing fears this market is on the verge of imploding. Whether real or not, that perception makes traders more comfortable buying and holding stocks. With parts of this world falling apart, the US market’s resilience is looking like an island paradise to international investors. We’ve come a long way from the 1,740 lows and are no doubt closer to the end of this bounce than the start. Anyone buying the dip here is clearly late to the party because best profit opportunities arise when everyone is filled with dread, not relief. While momentum can continue carrying us higher, the risk/reward changed dramatically. We are 15-points from recent highs and 85-points from the lower bound of a potential trading range. The market will likely consolidate recent gains and the best trade continues being buying weakness and selling strength. With as bad as the rest of the world has become, we could see international investors flock to US equities. This demand could be what fuels the next leg higher. Stocks don’t go straight up, so expect the rate of gains to slow. At best the market will consolidate recent gains just under or just above resistance at 1,850. Anyone sitting out of this bounce doesn’t need to chase here and can wait to buy the consolidation or dip after the frenzied buying dries up. Swing-trades can start looking for opportunities to take profits. We only make money by selling our winners and selling strength is the best way to avoid letting profits evaporate. Either sell proactively or use a trailing stop to protect these gains. Stocks dipped at the open, but climbed into the green by midday. The early low tested and held support at 1,810 and the 50dma. 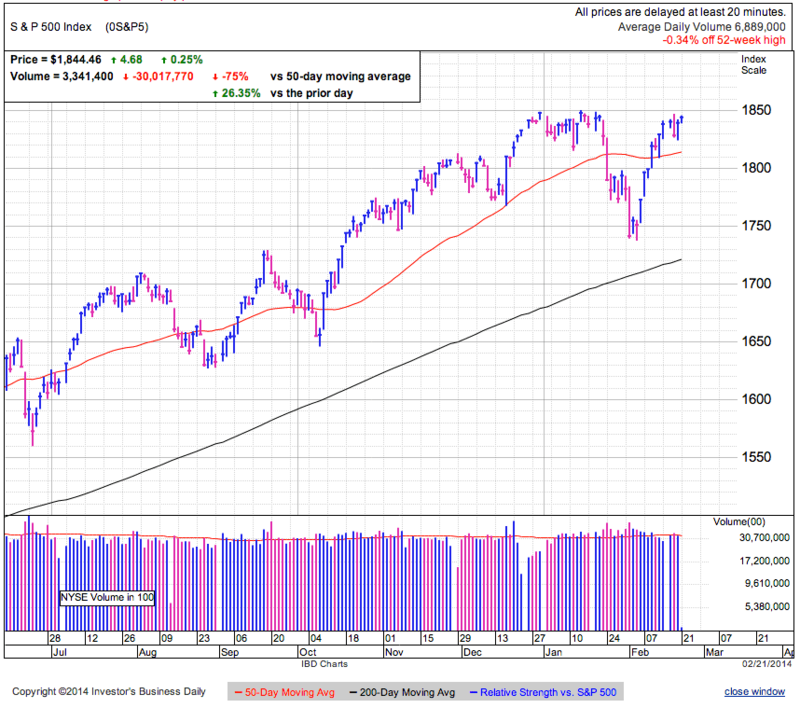 Early weakness came from a renewal of domestic and international economic concerns, but selling was contained and the market shook it off shortly after the open. While similar headlines lead to big losses a couple of weeks ago, the market is largely ignoring them now. If today’s response seems contradictory, it actually makes perfect sense when we think about it. Those that feared these stories sold during the dip to 1,740. Those that bought the weakness or held through it demonstrated little concern for these fears and are less likely to sell a recycled spin on the same headlines. People didn’t change their mind, but the market experienced churn in ownership and is why we ended up with a completely different response today. While many market participants obsess over headlines, news is less important than understanding who owns stocks and what they think. After everyone who fears a story sells, the market will largely ignore further developments because anyone who wanted to sell already did. News might be random, but the market’s reaction to it is not. Expected Outcome: Inside trading range, headed toward upper end. Stocks are behaving well following a fairly typical 5% dip. We recovered prior support and are back above the 50dma. Emotion driven selling ended as we bounced off the 1,740 lows and we now find ourselves 85-points higher. It is time to jump on the rally bandwagon again? Since the market trades sideways 60% of the time, chances are we need to consolidate last year’s gains before marching higher. If the market is entering a ~1,750 / ~1,850 trading range, we are approaching the upper bound and should be thinking more about locking in profits than adding new positions. While it is a little early to pull the ripcord, it is definitely late to be chasing. Head-and-shoulders and double-tops give a false sense of relief and security before resuming the prior selloff. While trading bounces can be extremely profitable, don’t get fooled into thinking the coast is clear. Buy weakness and sell strength. Clearly we are not experiencing weakness, so we should be looking closely for an opportunity to sell this strength. Recent gains are chasing out shorts and once the bears finish buying back their shorts for a loss, it will be interesting to see if a wider group of buyers steps in, or the rebound stalls as we near prior highs. A trailing stop under 1,810/50dma is not a bad way to protect gains. 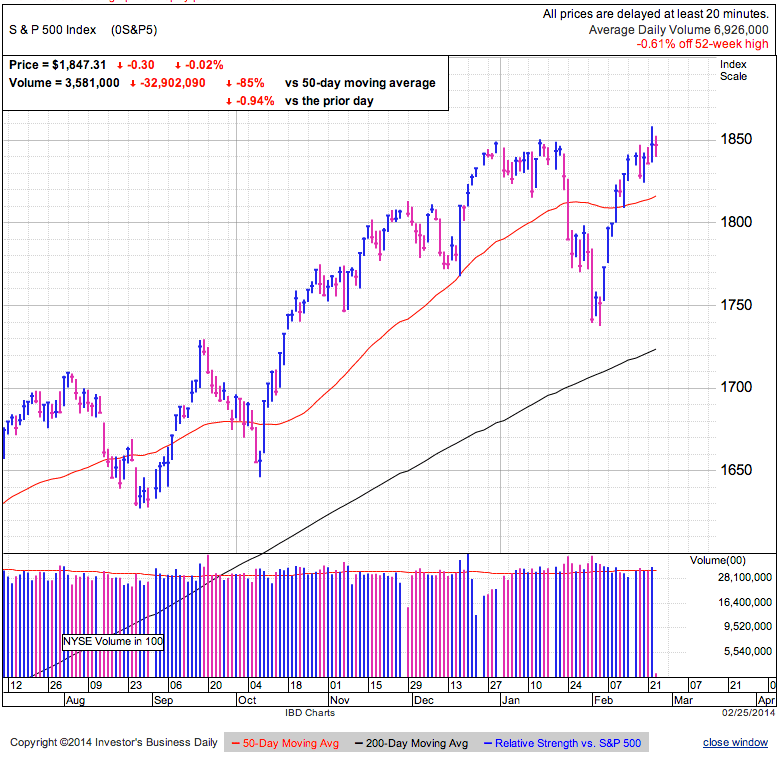 Stocks are trading sideways and consolidating the recent rebound. We are still holding the 50dma and recovered the majority of January’s dip. Nothing calms nerves like rebounding prices. Previously nervous owners were rewarded for holding this dip, making them even less likely to sell the next round of weakness. That lack of selling keeps supply tight and makes it easier for the rebound to continue. More than just tight supply, the selloff flushed many owners out of the market and they are now prospective buyers as they are forced to chase the bounce higher. While it is human nature to try and assign a cause to everything we see, markets go up and down for no other reason than that’s what markets do. It is human nature to bid up prices to unsustainable levels and then sell them down to oversold levels. So far this volatility seems to be little more than these normal and routine fluctuations. The time to buy the dip was when the crowd was fearful and selling stock at steep discounts. Buying now is a bit late to the party and if the market is in an 1,750/1,850 trading range, we are approaching the upper bounds and this is a better selling opportunity than buying one. Watch for signs of stalling demand, signaling this rebound is nothing but a temporary reprieve. Likely another round of panic selling requires more spooky headlines, so keep an eye out for anything that could unnerve the market. Stocks smashed through the 50dma and came a long way from last week’s 1,740 lows. Emerging Market fears evaporated as quickly as the came. What threatened the developed world last week doesn’t even warrant a footnote this week. Such is the ways of the market. While everyone knows the market has periodic 5 and 10% pullbacks, they lose sight of that every time we are in the middle of one. If everyone calmly held through a routine dip, we wouldn’t have one because the market doesn’t pullback without selling. While in hindsight every 5% dip seems like a great buying opportunity, reality is they are terrifying events to live through. The only reason a trader sells a 5% pullback is because they are convinced it will turn into a 10 or 20% correction. Pullbacks work because they convince so many traders this is no ordinary dip. That was clearly the case last week when many were dumping stocks over fears of Emerging Markets and a US economic slowdown. But one person’s fear is another’s profit. While we still have a way to go before this weakness proves it is nothing more than a vanilla pullback, it is shaping up that way. Recent fears over EM and the US economy are fading as quickly as them came. Nothing calms nerves like a rebound in prices. But don’t expect the non-stop rally to continue. Markets trade sideways 60% of the time and we are likely entering a 3 or 6 month consolidation as we digest last year’s big gains. Buy weakness, sell strength. While most owners are feeling better about their positions, few selloffs go in a straight line and they bounce on their way lower. We could easily be in the process of forming a head-and-shoulders or double top. Trading range or topping pattern? For practical purposes it doesn’t really matter since we sell strength in both cases. The bigger question is how high do we let this run before locking in gains. Sell before the highs, wait for new highs, follow with a trailing stop, or the easiest, buy-and-hold. It all depends on a traders risk tolerance and time frame. AAPL is close to closing the earnings gap, but that might not be so bullish. Recent strength follows comments from Tim Cook that he spent a big chunk of his US based cash hoard buying stock over the last couple weeks and hinted at new products. I saw one enthusiastic analyst suggest a $300 iWatch will sell in similar numbers as iPads. I don’t know what he is smoking, but I want some. There are few gadgets as geeky as a computer watch and there is nothing that screams enginerd like a calculator watch. Countless people I know have iPads, yet I don’t know anyone with a geeky watch. A more realistic sales projection would expect iWatchs to sell as well as Steve Job’s self-proclaimed Apple TV “hobby”. The iWatch would be an interesting gadget for the Apple fanatic, but nothing more than a rounding error on the financials. Since few people would throw out their current $2k flat screen TV for the rumored iTV, it would likely have an even smaller contribution to the bottom line. And if this new thing is a payment processing solution, expect it to contribute generate as much profit as Google Wallet.